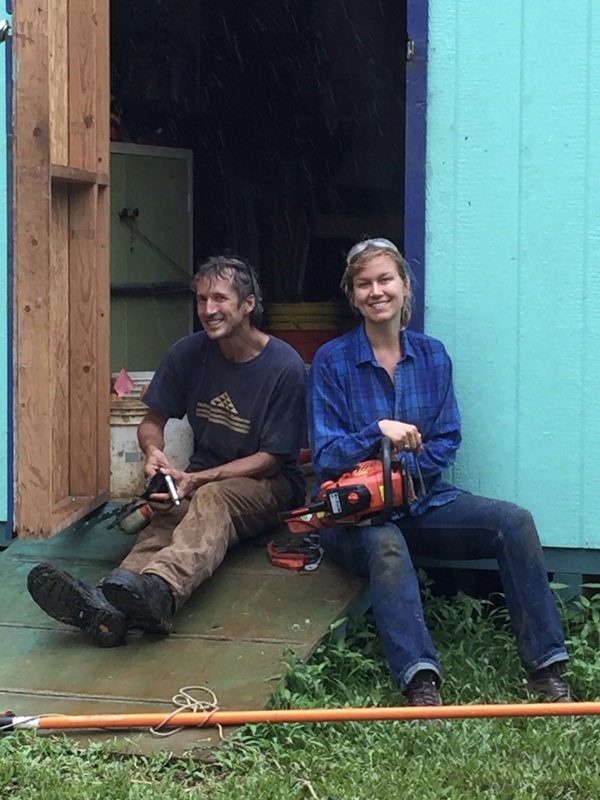 We gather on Saturdays to interact with, maintain, and harvest the food forest. The day begins at 9am and itʻs pau hana at 5pm. Around noon we take a break for lunch, which is usually brought to us by an angel named Natalie. Volunteering on our work day is the best way to learn through hands on activities and focused observation how and why we are building the forest in the manner that we do. Volunteer work day can be very physical and a great “work out," yet there are also tasks that are a good match for people who prefer less strenuous activities. Participants regularly comment that they are amazed at how much they learn in a short span of time. We also work with a smaller crew on Thursdays, focusing on maintenance and nursery work. Please check in with us about volunteering on a Thursday. Expect to be challenged and inspired! Building a food forest is real work, and while the task at hand may be demanding, the benefits are substantial and long lasting. Volunteers should always bring closed toed shoes, sun, rain, and mosquito protection, long sleeved shirt and pants as an optional or primary wardrobe choice, water and food to sustain energy and hydration during the activities, and work gloves, pruners, or hand saw if available. It is preferable for you to arrive at the start of a morning or afternoon work session and stay with us until its conclusion. Activities have an inherent risk of injury and all volunteers are required to sign a liability waiver, as well as ensure the safety of themselves and their fellow volunteers by following best practices as instructed by work day leaders. 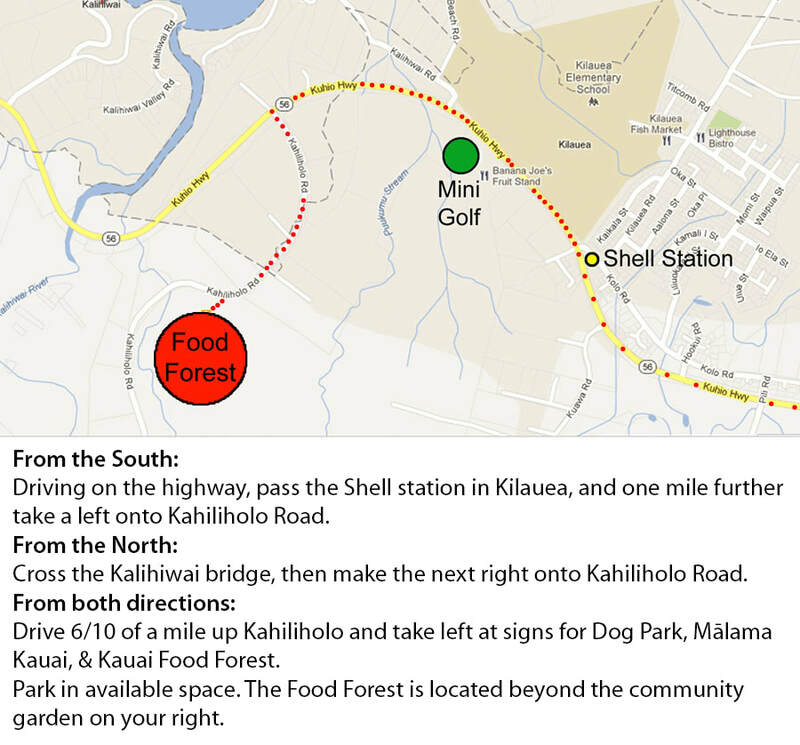 When you arrive at Wai Koa (see map and directions below) drive through the stone gate and turn to the right in dry weather. If it has rained and you see mud to the right, do not turn right but continue straight and park to the right. Either way, walk to the greenhouse and meet us there or sign in and find us in the forest. For help with directions or more information call Paul (808) 652-4118 or Marshall (808) 344-6796.